APART. Siena - (2 + 2) 50 m2. quarto duplo com terraço privativo extra, banheiro com chuveiro. Satelite tv, máquina de lavar roupa. O quarto é dividido da sala de estar com uma parede de pedra e vidro (cortinas), muito brilhante. Quelle belle découverte que la Toscane. Cette tres belle maison divisée en logement est logée dans un petit coin de paradis, entre vignes et oliviers. Anna Maria soucieuse de votre bien être veillera à ce que vous ne manquiez de rien. Très bien située entre florence et sienne, et entourée de villages tous aussi beaux les uns que les autres. Un supermarché et des commerces tout près. We stayed at this beautiful villa at the end of September 2018. Everything was even better than the photos, it was quiet, spacious and comfortable and the views from the terraces across the hills are incredible. Anna Maria and her family are so kind and helpful. If we needed anything someone would be there right away. Tavarnelle has a good supermarket for everyday needs and it is easy to drive to Florence, Pisa, San Gimigniano and other lovely hilltop towns, especially if you use the park and rides. When we drink our Pino Grigio back in Canada we can now remember the wonderful afternoon spent at the Ruffino winery, which is not far from Tavarnelle. 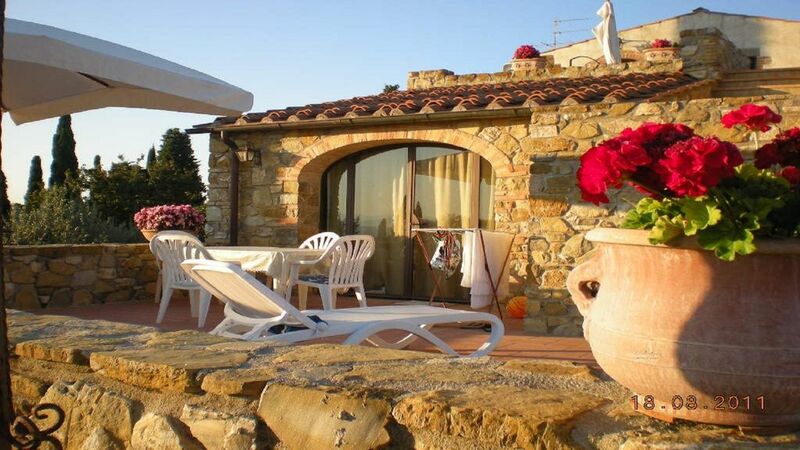 We would love to return to Tuscany and would definitely stay here again. We hebben hier 5 dagen gezeten, gelukkig was het mooi weer. Binnen is het krap. Vooral de badkamer. Beheerders aardig en behulpzaam. Zwembad prima. we regret that you didn't love the apartment, but according to your tastes, you had the opportunity, before booking, to check the square footage and the photos. The unit and its forniture are not old-fashioned but in Tuscan style; the kitchen and the closet are new and treated with non-toxic materials. The bathroom is 3 meters by 1.40. Super dejlig lejlighed, og skønt sted med udsigt til vinmarker og fantastisk natur. Helt igennem et fantastisk sted, hvis man er til storslået udsigt og ferie med ren afslapning. Rigtig fin og ren lejlighed med alt hvad man har brug for. Dejlig og rent poolområde, med fin pool. Der er en lille by i gå afstand, hvor der ligger en fin Coop, hvor man kan handle billigt ind. På torvet ligger der enkelte butikker og et par restauranter. 40 Km fra Firenze, hvor det også er muligt at tage bussen ind ( rejsetid 85 minutter) da det kan være rigtig svært at parkere i Firenze centrum, og heller ikke muligt helt inde i centrum, hvor biler ikke må køre. Så hvis man er til en afslappet ferie i ro og mag i fantastiske omgivelser, er det helt perfekt. Udlejeren var meget behjælpelig med ting vi kunne se, og hurtig til at svare på sms, hvis der var spørgsmål. Der ligger i øvrigt et outlet 1 times kørsel derfra i Barberino, hvor man kan shoppe mærkevarer billigt. Et fint sted med mange butikker. Alt i alt et skønt sted. Grazie Famiglia Thorup! I'm sorry that you spent 85 minutes to reach Florence, there was maybe an incident; it is usually 30 to 50 minutes maximum. Thank you for your visit! This place is glorious.. perfect for all the main sights -Florence, Pisa/Lucca, Siena and San Gimignano. The area is absolutely beautiful and peaceful and we couldn’t have asked for a better place to stay. Annamaria was a great host, and we are going to miss our ‘house guests ‘ Rosie and Bella. I wouldn’t hesitate for a second to come back. Thank you dear L. and A., it was so nice talking with you and we are so glad you brought home this good feeling, grazie! Très bon séjour en Toscane, merci Annamaria ! Nous avons loué ( couple avec 3 enfants : 17, 15, 11 ans) l'appartement 2 pendant 11 jours. Propreté et linge de maison impeccable, situation géographique idéal, excellente piscine (bonne dimension...), très bon accueil avec Annamaria qui parle Français !! Séjour inoubliable... Nous recommandons fortement cette location...Nul doute que l'on reviendra ! Merci Annamaria pour ta disponibilité et tes conseils ! Un grand merci à Vous pour Votre cordialité!!! ciclovias e trilhas para caminhada, também ao longo do rio Pesa, trekking - mercados ao ar livre - cursos de cozinha, cursos de massas caseiras - locação de bicicletas - eventos locais como mercados noturnos, comidas de rua, festivais de vinho e concertos.